Is It Time to Get Arrested for Happiness? Is it time for this middle aged grandmother to try on a pair of handcuffs? Why, yes, perhaps it is. I don’t have a date penciled in my calendar, but I can feel it coming closer. For my own personal happiness, for your personal happiness, and for a happier planet, I suspect I will soon respectfully engage in non-violent civil disobedience. Such a possibility is not a new idea. It’s been resting somewhere in the back of my consciousness since I first became involved in the Gross National Happiness movement. As I became increasingly aware of the enormous and urgent challenge of changing our economic structure to avoid environmental apocalypse, I’ve wondered if there might come a day when I would need to really put myself on the line. The entrenched systems we must change for a liveable planet are massive and powerful. Weening ourselves off fossil fuels and shifting from a growth economy to a new economy of well being is possible but it will be a very, very hard struggle. And, as the prayer of the Hopi elder says, “we are the ones we’ve been waiting for” — not, they are the ones we’ve been waiting for. Maeve McBride, organizer for 350 Vermont and mother of two, being led away from Governor Peter Shumlin’s office on Monday night. 63 other protestors were arrested with her. 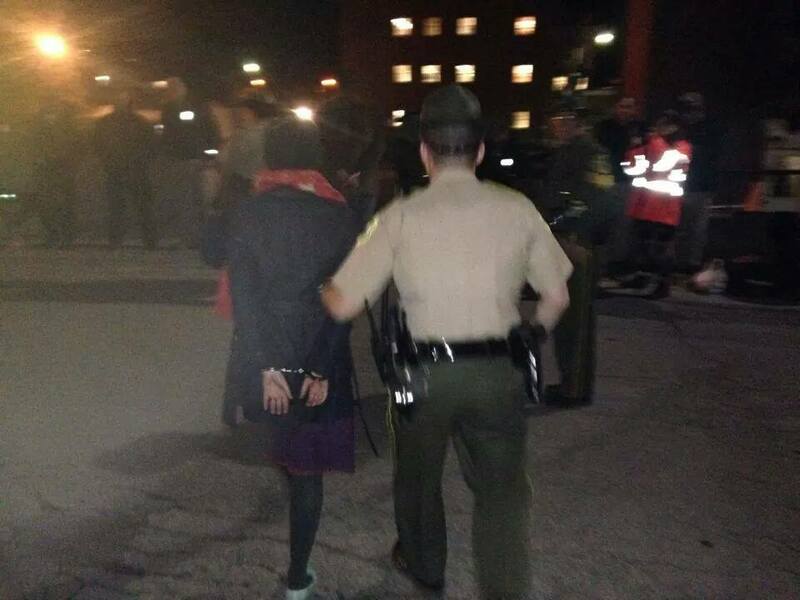 Thoughts of arrest rose to the surface this past week thanks to the actions of 64 brave Vermonters — from teens through grandparents, men, women, students, farmers, professors, all walks of life — who stood up for the love of Vermont, the planet, and future generations by sitting down. Sitting down, that is, in Governor Peter Shumlin’s office until he agreed to shut down a pipeline for fracked gas or until they got arrested, whichever came first. No surprise what happened. They were arrested for trespassing — an event that was beautifully captured on video. I was so grateful to and proud of the Vermonters who put themselves on the line that night. For several hours, I was one of the 500 or so supporters who rallied outside the office building to raise our voices against fossil fuel infrastructure and for those risking arrest on the inside of the building. Rising Tide Vermont was one of the rally and sit-in’s sponsoring organizations; check out their website for information about the ongoing pipeline struggle. As I chanted, clapped, sang, and sometimes yelled as hard as I could, I felt waves of emotion: anger and frustration at a governor who talks the climate change talk, but is not walking the walk; despair at the seemingly immeasurable depths of corporate greed; joy at being in community with strangers united in common purpose; admiration of citizen courage, commitment, and creativity; and heartbreak looking at the babies around me and wondering what climate change will mean for them. I also felt heartbroken as farmers and parents from affected parts of Vermont testified about what this pipeline means to them, and the beautiful fragile natural landscape which we all love. Even Lake Champlain is not sacred — Governor Shumlin wants the fracked gas pipeline to be built under this precious, already-threatened shining jewel in the crown that is Vermont’s landscape. I was appalled to realize that our governor plans to throw Vermont and Vermonters under the bus in this way. So I yelled and clapped wholeheartedly — until it was time to leave for my Monday night yoga class. Big mistake. Oh, I know self-care is important, especially as we age. Yoga is vital to my physical and spiritual well being. Yet the whole drive home, my body was practically screaming at me to turn around. How could I be going to yoga when other Vermonters were awaiting arrest? I was so distracted driving home, it’s a wonder I didn’t have an accident. I was in the wrong place at the right time. I don’t want to make that mistake again. There are a lot of brave people out there. I’ve watched Bill McKibben, Gus Speth and others getting arrested in Washington, DC to focus America’s attention on the need to block the Keystone pipeline. We’ve all seen video of non-violent Occupy Wall Street resisters getting pepper-sprayed. Courageous eco-warriors worldwide are fighting for not only a livable future but a livable present, like the Marshall Islanders taking to their kayaks to block coal shipments and fight for the very survival of their nation. Realistically, it is safe and civilized here in Vermont. In the video, you can see how courteous the whole episode was. There is not a high likelihood of pepper spray here! Also, I’m self employed, so don’t have to worry about any ramifications from a corporate employer. And I wouldn’t be stepping outside of societal norms; my community would be very supportive — as I am supportive of those who have already donned the handcuffs. Still, the prospect is sobering. When Bob and I talked about this last night, it was a subdued and sad conversation. How unfortunate, indeed, that even here in Vermont — the Green Mountain State — caring, committed citizens have to be willing to go to jail for our voices to be heard. Right there, that’s worth a good cry. So, how then does this relate to happiness? First of all, if Mother Nature ain’t happy, ain’t nobody gonna be happy. Both a healthy environment and good governance are fundamental planks of any Gross National Happiness system. That’s pretty basic. Second, on the personal level, this might be a good moment to observe that happiness is not about having a smiley face all the time! Certainly, I’m all for feeling the joy — and there is much joy in working together for a better world, especially when one of the bands is playing — but happiness is also about being authentic, living in concordance with our values, working toward goals, following a meaningful path, being in community, and being so engaged in life that time just seems to stand still. For me, raising my voice also means working from my strengths. I am not a scientist or a political strategist. But I am an extrovert, and I can show up when organizers put out the call. Or even when they don’t call! I think my first “protest march” happened in the summer before I entered second grade. While my parents were downstairs watching the Democratic National Convention — they supported Adlai Stevenson — my siblings and I were upstairs chanting, “We want Kennedy! We want Kennedy!” Talk about being authentic — I guess I’m just a born rabble rouser. By the way, though I haven’t seen any happiness studies on this topic, all you older folk should know: I feel so much younger in these climate action crowds. I love, love, love how thoroughly mixed these crowds are in terms of generation. We are all in it together, and it feels great to be on the same team with teenagers, great grandparents, and everyone in between. That word, love, crops up for me a lot. “Standing on the side of love” is a rallying cry for the Unitarian Universalist Association, of which I am a member. And for me, that’s what it really boils down to — love. 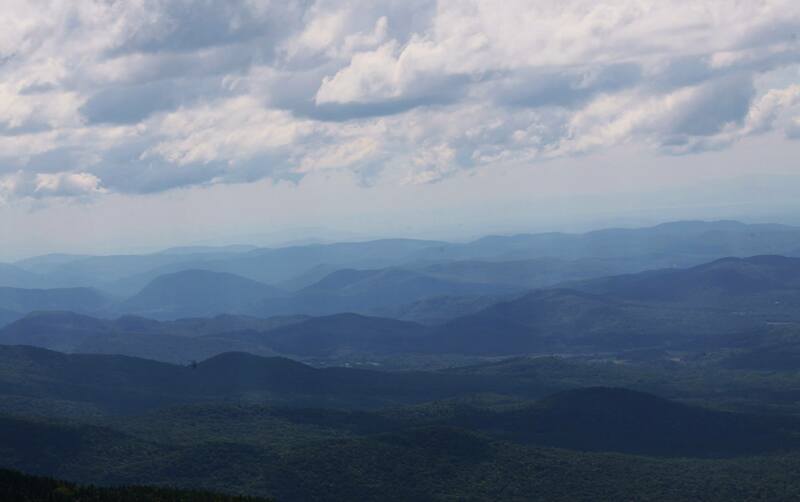 Love for the entire astounding planet, as well as the little piece of it called Vermont and the people who live here. On the day after the arrests, with a heart full of love, I listened repeatedly to one of Vermont’s musical treasures, Jon Gailmor’s “For the Love of Vermont.” I so want to do my best for this land I love! At one point during Monday’s demonstration, three awesome teenagers from my own neighborhood were marching right in front of me — I felt such love for those beautiful young ladies! But the strongest motivator of all is love for my own grandchild — and for all your children and grandchildren too. For family and friends. For summers and rainbows and loons. For the grandeur of autumn foliage. For blueberries, garlic cloves, and snow shoeing in the woods with a dear friend. For the whole crazy package that is life. Love, love, love. Right now, when I think about engaging in civil disobedience, I am not feeling anger or hate or fear or blame — it is love. Just love. All You Need Is Love … Or Some Other Signature Strength! Ever think of modifying something like this and sending it to vtdigger as a commentary. It would be worth more than preaching to the choir as most rallies do. this one was different. Enjoyed watching you at the rally. Interesting idea, George. Another friend thought I should submit it to Huffington Post. I’d love to … I will mull over these ideas.